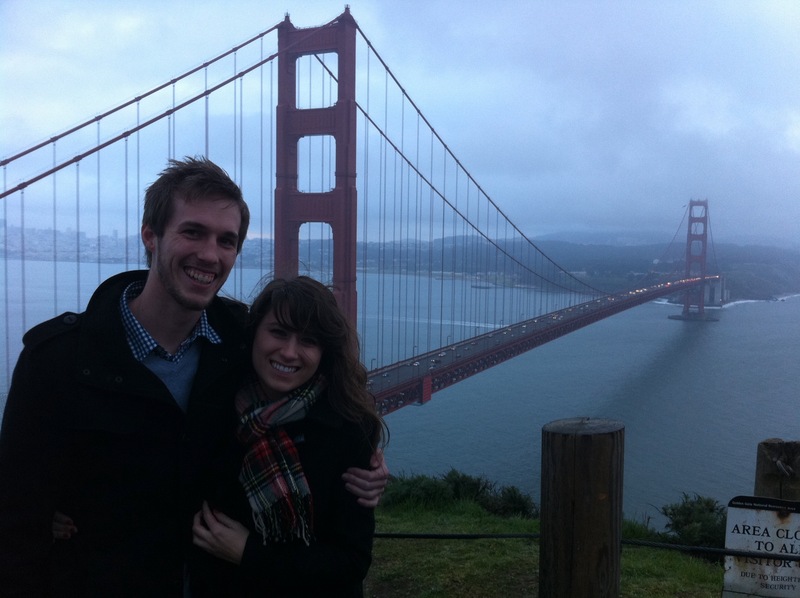 On January 29, 2011 I proposed to my girlfriend Ashley overlooking the Golden Gate Bridge and the city of San Francisco and invited all of my friends (and the internet) to watch as I did it. I love my fiancé Ashley. I also love the internet and social media. So, naturally, when it came time for me to propose to my girlfriend I decided to combine the two, and who doesn’t love hearing about (I think) creative ways of proposing? Here’s how it went down. One week before the planned date my accomplice Lucas and I performed a reconnaissance mission to the planned location Hendrik Point on the Sausalito side of the Golden Gate Bridge. The weather was warm and sunny making for a picture perfect sunset across the Pacific’s horizon. Unfortunately, this weather would not remain through the week and would be replaced by cold rain and blustery wind. We tested the internet connection of our mobile hotspot and planned out each step I would take including the exact spot where I would drop the knee. After coming up with a few alternative scenarios just in case, we left, not to return for one week for go time. That week, Lucas and I would meet after work and begin working on the specifics of the plan. First, we needed a platform where all the elements would live and where I could point everyone to go during the day. For that, we used a basic Tumblrtheme with a few custom modifications thanks to Lucas. 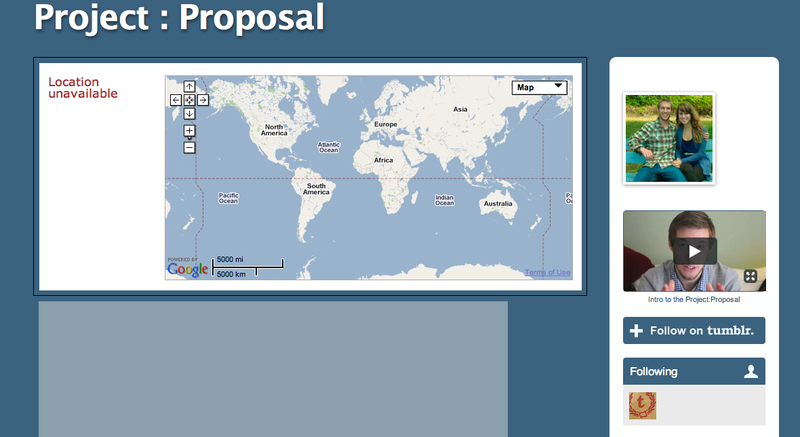 I titled the site “Project:Proposal” and we began adding features. At the top of the page we added a custom Google map that would be constantly updating our location throughout the day as we drove around San Francisco. Below that was a window for a slideshow of pictures that would automatically be updated as I took pictures using the Smug Mug iPhone app. Underneath the slideshow was a space for me to update the blog with status updates and/or videos. And finally, there was an embedded Ustream window which would be broadcasting the proposal live from the location in San Francisco. Once the day arrived I would use Hootsuite to schedule Twitter and Facebook posts throughout the day pointing everyone to the Tumblr page, which would also have an introduction video of me explaining the proposal plan. You might be thinking to yourself “how did you insure that she wouldn’t get tipped off from her friends who had seen your status updates?”. This proved to be a challenge that almost became a deal breaker for the entire plan. Lucas and I brainstormed several different ways of getting ‘phone control’ as we called it. Ideas ranged from tricking her into forgetting it somewhere to straight up stealing it. We made an attempt the night before to cut off all the power to the place where she lived in hopes that her battery would be dead without enough time to charge it. This failed horribly and ended up just cutting the power to the rest of the house where she lived. We decided to take a drastic measure that Lucas brilliantly came up with. Knowing that Ashley’s mom was the account holder for her cell phone service, I called her and told her to call AT&T and temporarily ‘disable’ Ashley’s phone AND set a new password different than the main account password so Ashley wouldn’t be able to re-enable her phone. The day finally arrived and I woke up to a HeyTell message from Ashley explaining that her phone wasn’t working. Excellent. With status updates locked and loaded, an iPad 3G tracking our location, and my iPhone ready to snap pictures, we left for San Francisco. Oh and I had the ring too. As I kept Ashley distracted window shopping and eating lunch, I anxiously looked at my watch as the time approached for the first status update to launch. Within five minutes of the first status going out I got a text message wishing me luck on my proposal. “Great” I thought, “I didn’t account for this”. Now I couldn’t let Ashley use my phone at the risk of someone sending me another text message or phone call. This wasn’t that easy because she constantly was asking for my phone in order to try and figure out the issue with her phone service. Using coded messages, Lucas kept me updated with the status of everything throughout the day. Things were, considering all the elements involved, going smoothly. The time approached for us to cross the bridge and head up to ‘the spot’. I was sick to my stomach because I was so nervous. I told her I knew of this “cool spot” where you could see the whole city. After crossing the bridge and driving up the hill, I parked the car and, ever so carefully, hid the ring in my coat pocket. Unlike the week before when the weather was warm and calm, today was drizzly, windy, and cold. It took some convincing on my part to persuade Ashley to actually get out of the car into the blustery elements. We walked up to the spot and out of the corner of my eye I could see Lucas and his girlfriend Amy in their positions quietly and inconspicuously following us with a video camera live streaming the whole thing (Lucas wore a hat and Amy wore a wig to guarantee Ashley wouldn’t notice them. I have dedicated friends). I carefully guided her along my predetermined route keeping her attention away from Lucas and Amy and then I had one last picture taken of us to be uploaded to the site. We continued walking and landed on my mark. I told Ashley I had something to show her and brought out my phone and played a slideshow of pictures from our 1 year anniversary. After the slideshow was finished I turned Ashley towards me said my sweet nothings to her, reached into my pocket, got down on one knee and asked her to marry me. As you can see in the video, she was very, very, surprised and excited. And so was I, so much so, I forgot to put the ring actually on her finger and she asked me “aren’t you supposed to put the ring on?” and I responded “I don’t know, I’ve never done this before!”. After getting the ring on her finger and sharing some hugs and kisses I pointed over to where Lucas and Amy were positioned and they came out and handed Ashley roses and me a bottle of champagne. Project:Proposal was a success and Ashley and I were officially engaged to be married! Once everyone watching was sure she, had in fact said ‘yes’, text messages started pouring in with congratulations and well-wishes (and also a few shout-out requests for the camera as it was still broadcasting live). I was excited everything went so smoothly AND she said yes! So excited, I shook up the champagne bottle and completely didn’t take into consideration the wind and exploded the champagne directly into a headwind all over myself and my new bride-to-be. It was a newbish move, but we had a good laugh (and so did everyone still watching live). That day, five months ago today, Ashley said “yes”, and one month from today, Ashley will say “I do”, and I cant wait. I will intentionally go out of my way to tell people why Apple products are superior to any other product on the market. I will (and have) wait in line for eight hours outside an Apple store in order to purchase the new iPhone even though I can purchase one a week later with no line. I will pay on average 25% more money for an Apple product as opposed to a comparable non-Apple product, with a smile on my face. I will gladly suffer many inconveniences caused by Apple products and not hold it against them for a moment. What’s more, I am not the only person who does this. There are millions of Apple fanatics who do the same thing or more! Why? 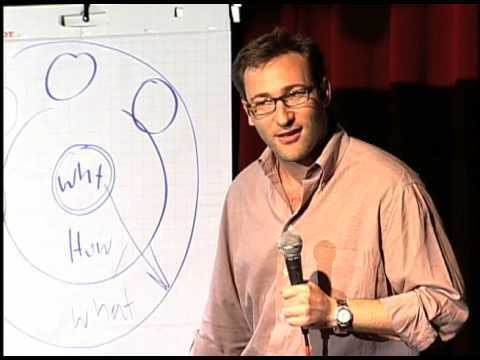 Simok Sinek - Author of "Start with Why"
allows Apple, or any other company following their ‘why’, to be so successful and command such a dedicated following. Sinek argues in his book “people don’t buy what you do, they buy why you do it” and he calls this principle the “Golden Cirlce”. I think it is very profound and is something a lot of organizations miss. Imagine a target. It has three rings. The outer most ring is the ‘what’, followed by the ‘how’ ring, and lastly the ‘why’ ring in the middle. 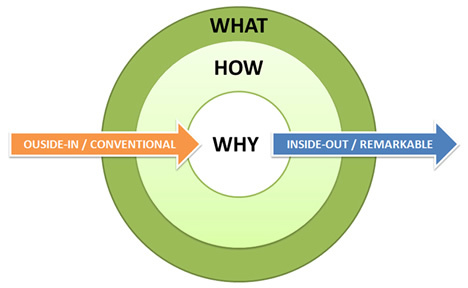 Sinek says that most organizations start with the ‘what’ and work their way in to the ‘why’. Companies always tell their customers ‘what’ they do first and not ‘why’ they do what they do. For example, if Apple were to start with ‘what’ they do their marketing message could say “we make great computers, they’re beautifully designed, simple to use, and user friendly, want to buy one?”. This is not exactly the most convincing or inspiring sales message ever heard. In fact, it sounds a lot like most other companies and sales pitches explaining ‘what’ they do instead of ‘why’ they do it. Here’s more like what Apple’s marketing message sounds like: “everything we do, we believe in challenging the status quo, we believe in thinking differently, the way we challenge the status quo is we make our products beautifully designed, simple to use, and user friendly, we just happen to make great computers, want to buy one?” All that really changed here is the order of reasons you should buy a computer, going from ‘why’ they do what they do, to ‘what’ they do. People don’t buy what you do, they buy why you do it. This helps explain why people like me will do seemingly absurd things like wait in line for eight hours to buy an iPhone the day it comes out! I don’t do all those things simply because Apple makes beautifully designed computers that are easy to use and user friendly, although that does go into my decision, the real reason I buy from Apple is because I identify with their ‘why’. Like Apple, I too want to challenge the status quo, I don’t want the products that everyone else has or that are built all the same way, I want something that is bigger than that and that is why I buy Apple products. I believe, and literally buy into their mission for creating products. The Golden Circle principle is powerful. To further the point of the Golden Circle, if Apple’s mission was not ‘to challenge the status quo’ and was instead ‘build computers’ it would make no sense for them to have made some of the decisions they have made. However, through this filter, it makes sense why Apple would move into other industries outside of the computer industry, they are ‘challenging the status quo’. What business does a computer company have being in the MUSIC industry? That is unless they were a company set on ‘challenging the status quo’ and then it makes perfect sense why a company like Apple would go into the music industry…to challenge the status quo! The same could be said about the cell phone industry and Apple’s iPhone. It is within their mission of ‘challenging the status quo’ to move into those industries. So much so that in 2007 Apple changed their name from Apple Computers, Inc. to Apple, Inc. Makes sense because they are not just a computer company. History is littered with examples of companies that lost their ‘why’. In his book, Sinek tells the story of the railroad industry in the late 19th century which was dominating the transportation industry at the time. All of these companies defined themselves by ‘what’ they did and not ‘why’ they did it. They would say “I am in the railroad business” and that was enough for the short term. However, the beginning of the 20th century introduced new transportation options, such as the car and later the airplane, eventually crippling the railroad industry. Now, had the railroad industry defined themselves as being in the “people transportation” business, they could have noticed emerging technology and followed trends leading them to adapt and move into the car or airplane business and thus still thrive through the 20th century. Today I am proposing to my lovely girlfriend Ashley! I’m not only proposing, but I am including friends and family who can’t be there in on the fun. I love Ashley, technology, and social media so I have decided to blend all of those things together into my marriage proposal. My friend Lucas and I created a makeshift website that will serve as the portal in which others can share in the experience. Go to the Project : Proposal site here and enjoy being part of my proposal! 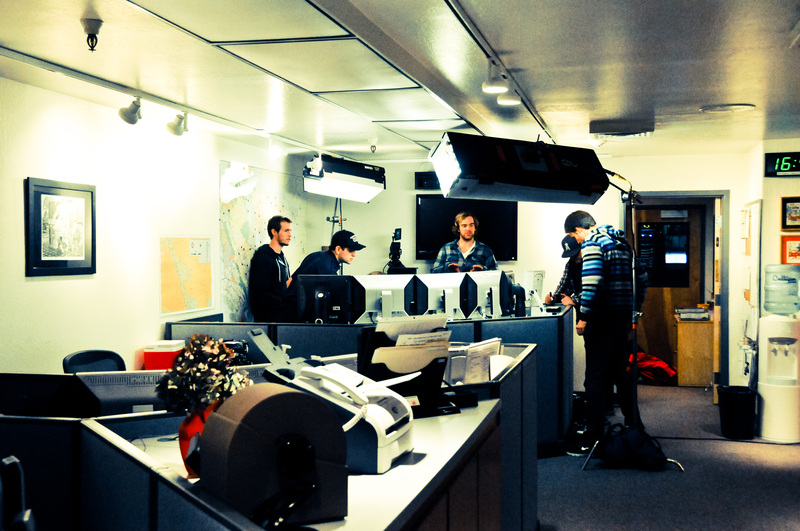 If you recall from my blog post from last month, I was involved in a big video production of a PSA. Well, the truth is, it was much bigger than just a PSA. 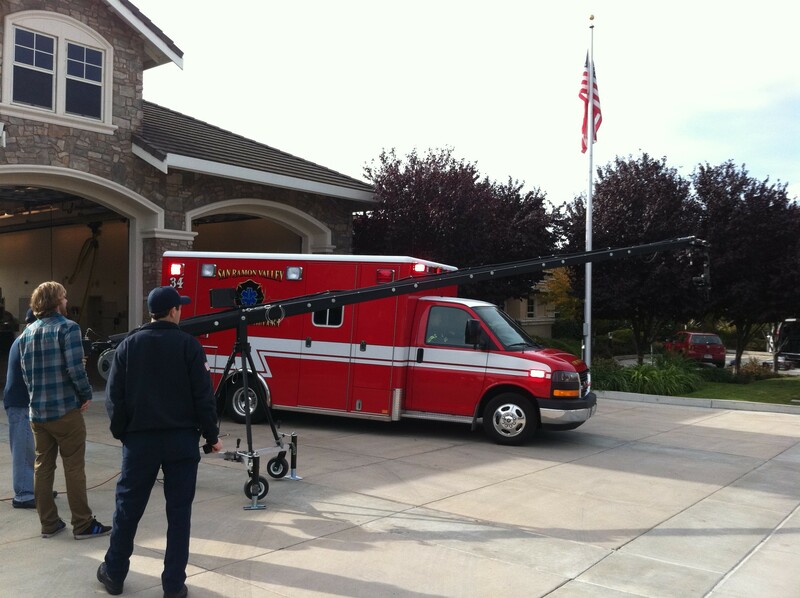 Today at a press conference in San Ramon, CA the San Ramon Fire Protection District released a truly innovative groundbreaking application that will literally save lives. If you look at my previous post you can read about the background of the project itself and about the SRVFPD and their innovative nature that lead to this app. The story behind this second version is really amazing. When my friend Lucas first brought me on to the project he explained to me that him and Fire Chief Richard Price were out to lunch one day, while on duty, and they noticed an ambulance pull into the very shopping center where they were having lunch at. 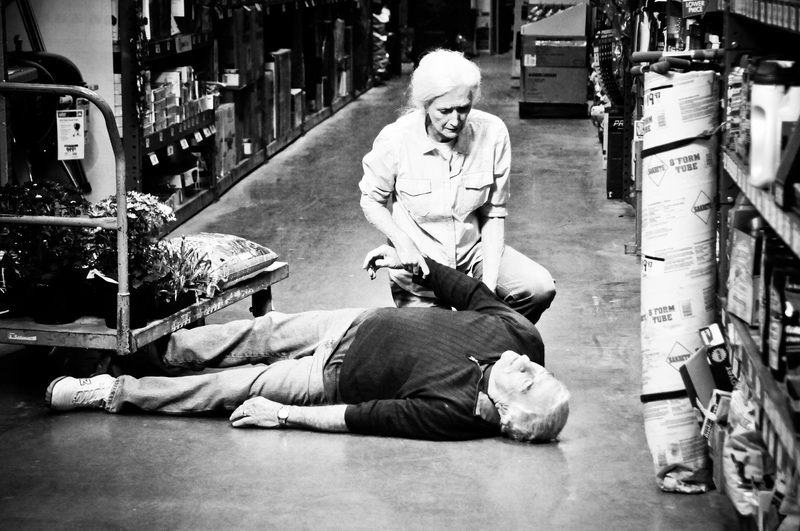 Later, they came to find out there was a person having a heart attack in the store right across the parking lot from them and they had no idea. Both Lucas and the Fire Chief are medically trained professionals who, if they had known of the incident, could have easily performed CPR in order to significantly improve the chances of that person surviving a cardiac arrest. 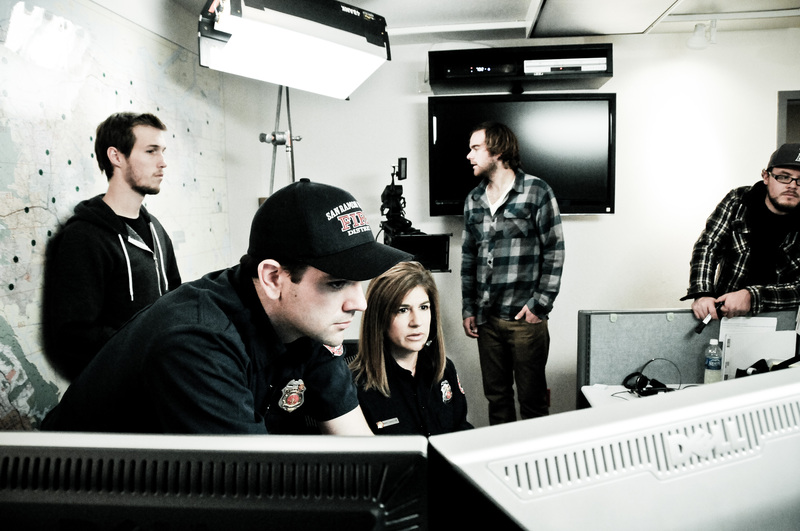 This is where the idea came to form: During a cardiac arrest emergency the fire department will dispatch their trained citizens for assistance. 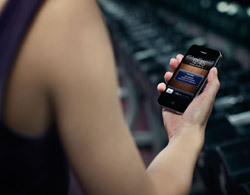 Development of the app began immediately. Obviously there is a great opportunity for an app like this to make a real impact. When someone has a cardiac arrest (in a public area) and 911 is contacted, the dispatch center dispatches both the emergency services and the iPhone app. The server searches all of the CPR-subscribed devices that are within a certain proximity to the medical emergency and sends their phone a push notification and a distinct alert tone. 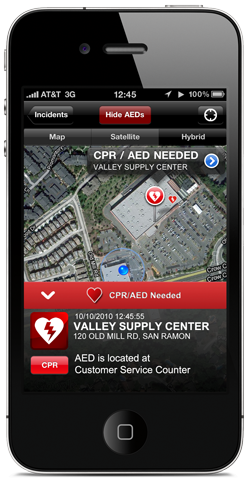 When the app is opened the user is shown the business name, the address, and where the AED is located, if available. The user chooses the “Go” button and a map with their current location and a pin of where the incident is taking place is shown. There is also a CPR button that will show key reminders of the proper way to do CPR. 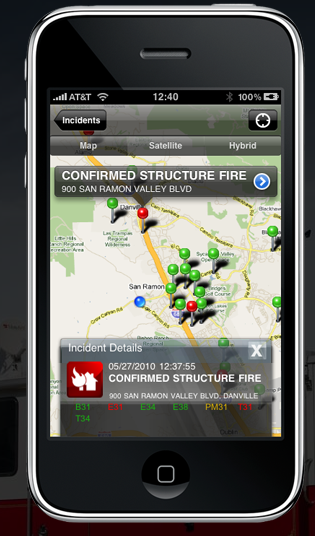 It is clear to see how effective this app can be in an emergency situation and the great life saving potential it has. Today at the press conference it was also announced by Workday CEO Dave Duffield that they will be building the Android and Blackberry version of the application for free in order to encourage the adoption of the application by as many people as possible. Even more amazing is that the SRVFPD is giving the application away free of charge and have plans to make the code available as opensource to encourage the spread of the application and share the life saving capabilities. I feel very honored to have been involved in this project and am thankful for Lucas and Fire Chief Price for including me in this groundbreaking project. Watch the final PSA here and if you have an iPhone app be sure to download the app and get more information here. This post is very important to me because it is about a project that I am really passionate about and am extremely honored to be a part of. 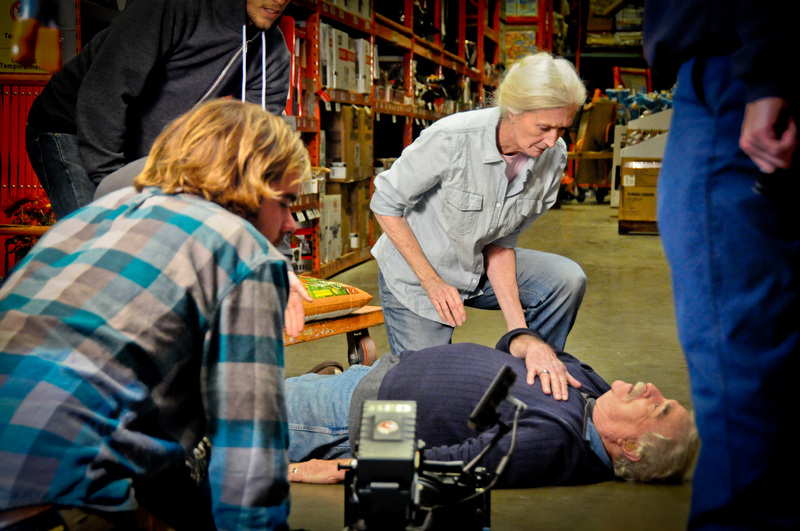 I recently got to be a part of a very important video production about heart attack awareness and CPR preparedness. This is about the people who helped make it a success and the position I was able to perform. 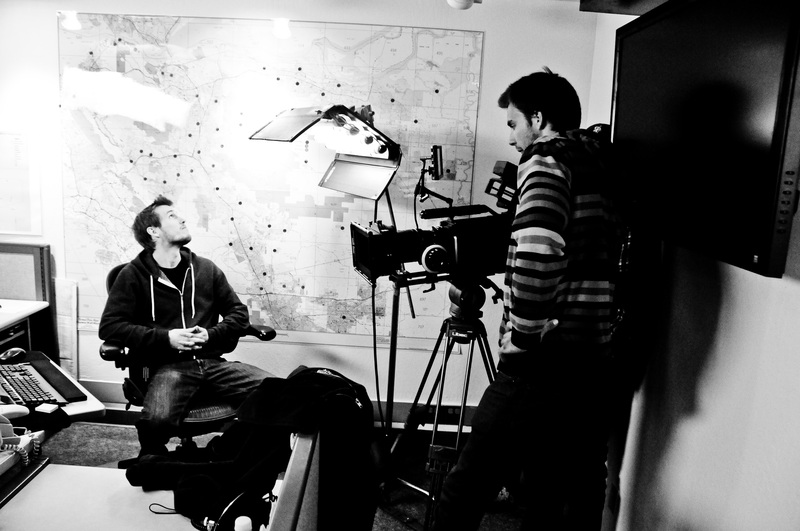 My friend Lucas Hirst brought me on board and this is about part of the production process. Enjoy. Lucas and I have known each other for a long time dating back all the way to high school when both of us were in video production class together. 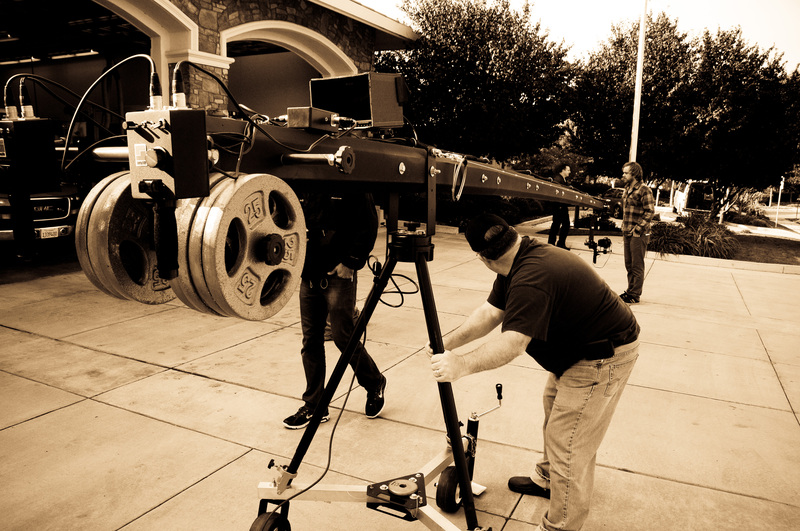 We used to shoot all kinds of videos for fun and for pay and even had our own production company called NITRO Productions where we filmed, weddings, fundraisers, etc. 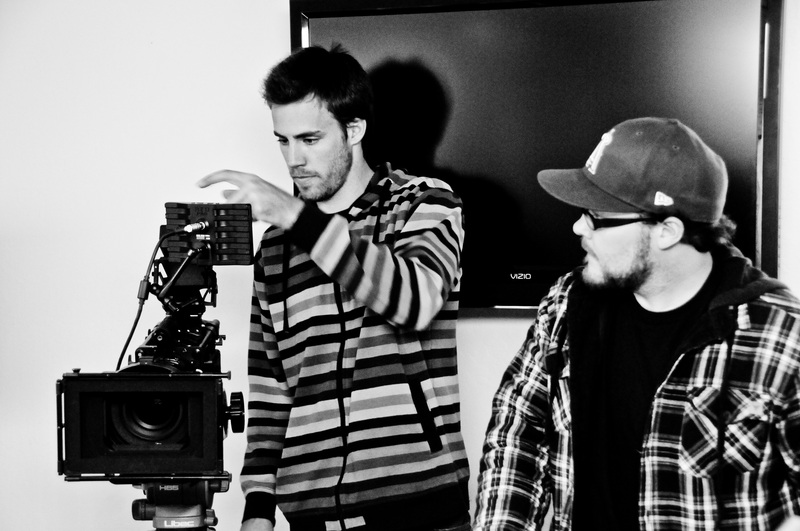 Although neither of us really continued to pursue film after high school, we knew we worked really well together. So, after one of our usual heated racquetball games (I won, of course) Lucas began telling me about a new project he wanted me to be a part of. 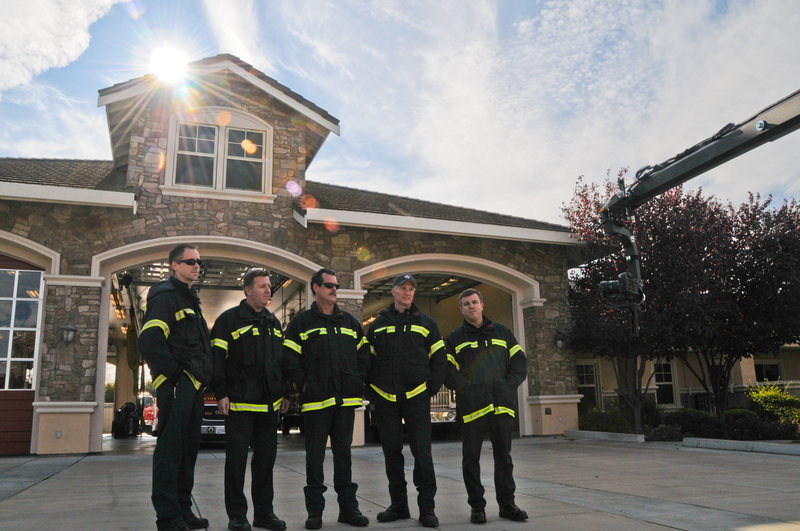 He has volunteered and now works for the San Ramon Valley Fire Protection District (SRVFPD) for many years now and has been able to have some tremendous opportunities through his time there. You may be asking yourself what kind of “tremendous opportunities” comes from a local fire department? Well clearly you don’t know about SRVFPD. Not only is the SRVPFD a state-of-the-art fire district in terms of equipment response times and their staff and overall organization, they are also very forward thinking. Go to their award winning website, www.firedepartment.org (yes, FIRE DEPARTMENT), and you will quickly see the high caliber this fire department is. This website has all the information about the fire department you could possibly ask for, including incredible photos and videos from actual incidents! Not only is their website very web 2.0, this past Summer they even released their very own Fire Department app for the iPhone. Not only can you access all the information available on their website, you can even get push notifications when live incidents are taking place and it will show you on a map where it is happening! Ever see a fire truck go by and wonder where it’s going? Check out the app and you can see exactly where it’s going and what type of incident it is responding to and listen to the live radio at the same time. This app is revolutionary and has already been downloaded thousands of times across the world even. Oh, and my friend Lucas, he was the project manager for the website and the iPhone app AND takes all the video and pictures for the website. Really incredible. That’s the kind of tremendous opportunities I am talking about. 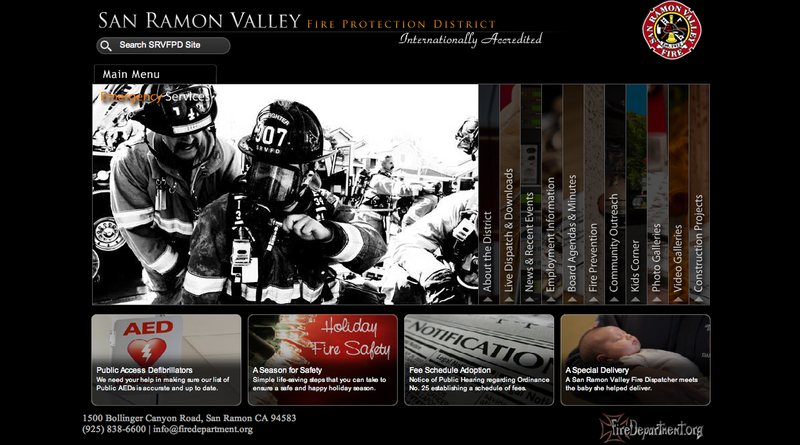 Check out the website and download the iPhone app and see for yourself the caliber of this fire department. So, now you can start to see why I jump at any opportunity to get involved in a project with my buddy Lucas and the SRVFPD. 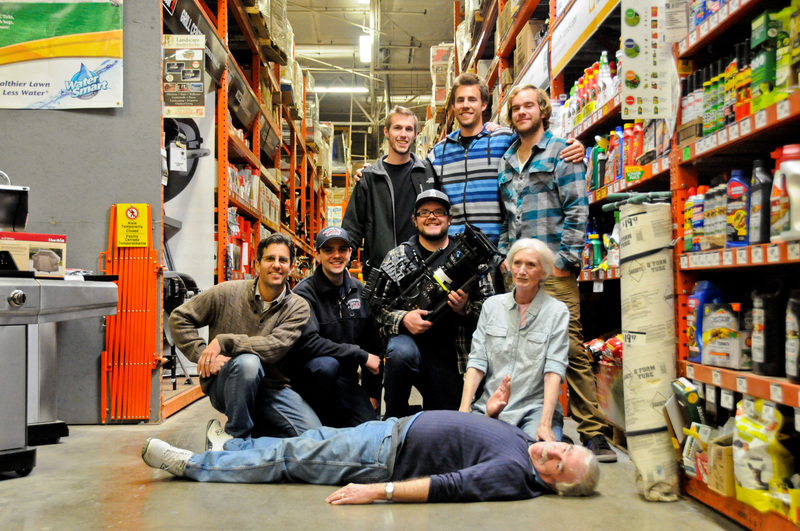 The project Lucas introduced to me was a video to raise heart attack awareness and CPR preparedness. 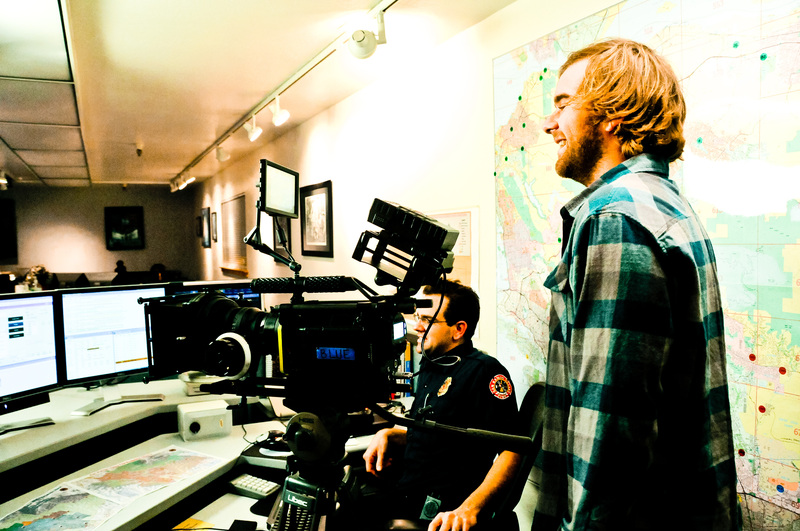 As Lucas explained to me the desired (huge) outcome that the fire department had in mind for this video, we both began to feel less confident that our dated videography skills would be enough to accomplish this. 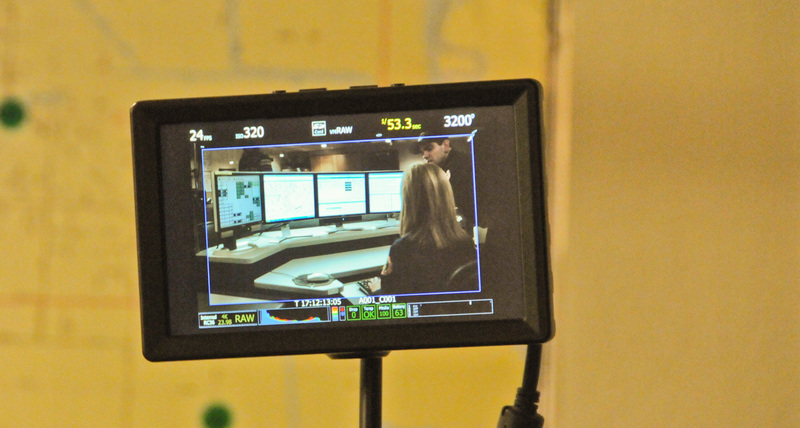 So, for this project, we decided to take on the role of producers. I would be in charge of casting the actors and managing the budget and Lucas would take on the logistics of the locations as well as the general vision for the overall shoot and we would both do any work required for the production of the shoot. 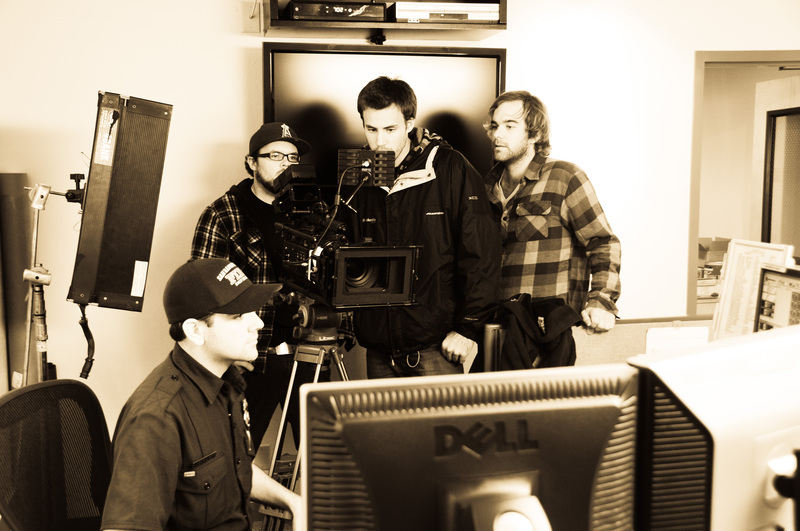 In order to accomplish the high production quality the fire department was after, we needed a production crew that was experienced and talented. Lucas and I began thinking of who we could get that fit that desired level of quality. I started thinking of my film major friends from school and immediately thought of Daniel McNutt. I knew he was both experienced (he currently works in the industry in LA) and very talented. Lucas and I watched his reel on his website and immediately knew this was our guy. After introducing the project to Daniel and confirming his availability he was excited and on board. 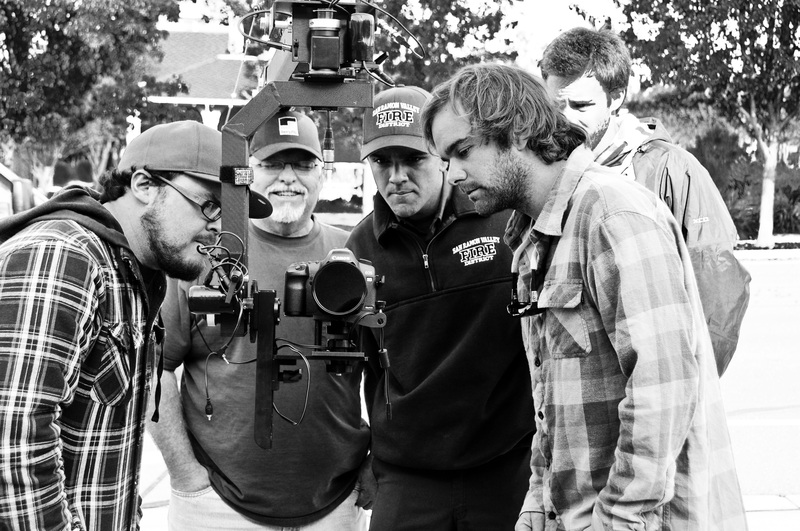 Daniel would be our Director of Photography and would bring along his talented friends Jeff Webster as Key Grip and Kyle White as Camera Operator. 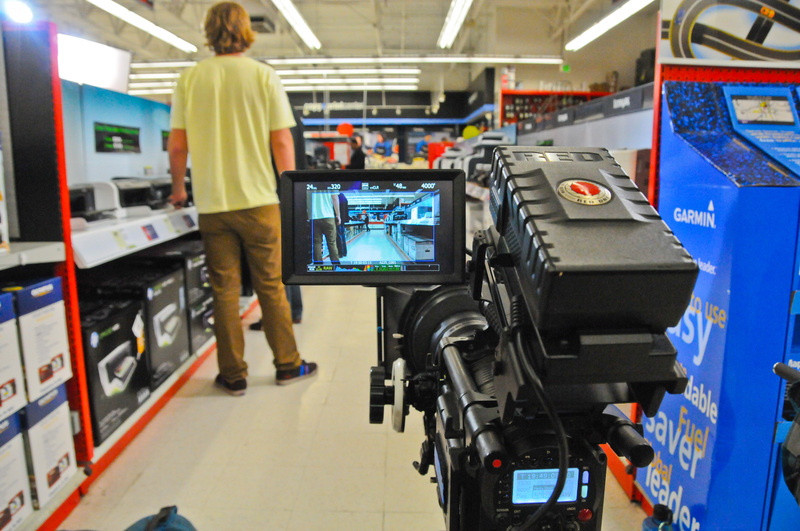 Through their connections they were able to get professional-grade equipment, including the Red camera, for a fraction of the cost, which was great for our budget. With the help of Craigslist and a casting website I was able to find a number of potential actors to fill the spots we needed. Lucas and our Director Scott Stiefvater (who is actually our old film production teacher) took care of the auditions, which I couldn’t be a part of because I was working. 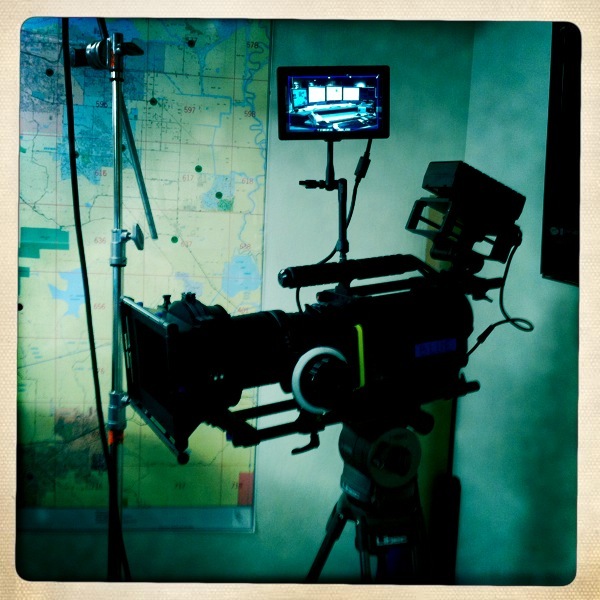 We got our two actors and production started the following morning on Tuesday. Our day consisted of four locations: Fire house, Staples, call center, and Home Depot. 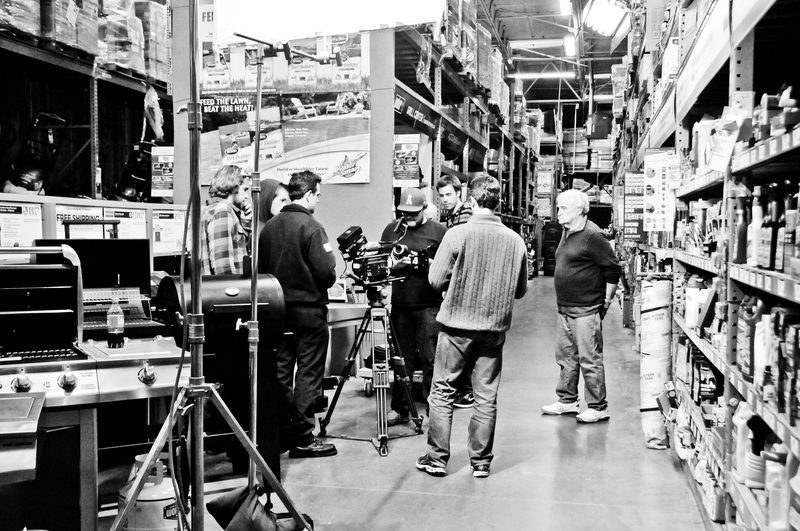 Thanks to Lucas and Daniel who worked tirelessly on the specifics of the production, planning out shots, locations, equipment, and overall feel, the production went amazingly smooth. We worked for 18+ hours and not once did we feel rushed or the need to compromise production value for the sake of time. It was amazing. 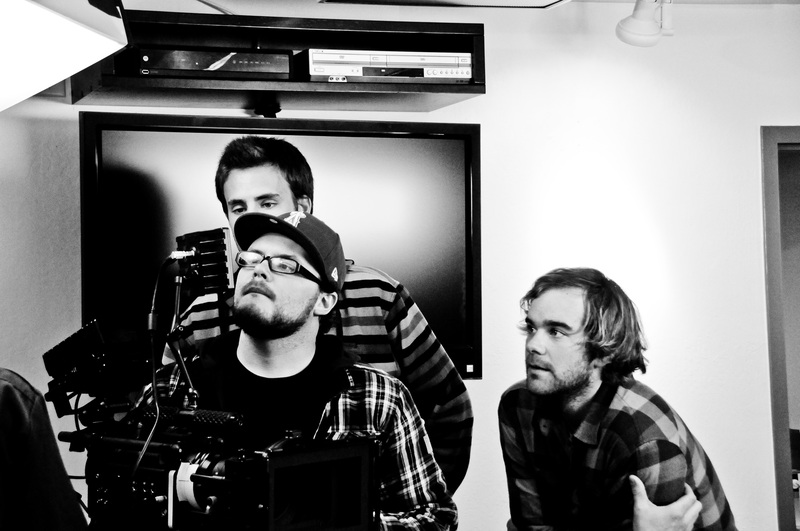 Working with Daniel, Jeff, and Kyle was incredible. They’re like a trio of film-making-superheroes who can read each other’s minds and know exactly what the other is thinking and how to accomplish the desired shot. Not only are these three guys very experienced, they have tons of talent and a huge amount of knowledge despite their age. I don’t know how many conversations I heard them have about how excited they were about seemingly tiny details of the project such as new cables, wattage, lenses, and various other gear. Their enthusiasm was definitely contagious. Also, the respect they had for each other and those involved with the production (even when they were the most experienced by far and I’m sure we got in their way) really set a great standard on the set of the production. I would, without a doubt, work with any of those guys again given the opportunity and I know everyone involved would also. I can’t write about this incredible project without mentioning the Fire Chief of SRVFPD, Chief Richard Price. He was integral to the overall success of the project. 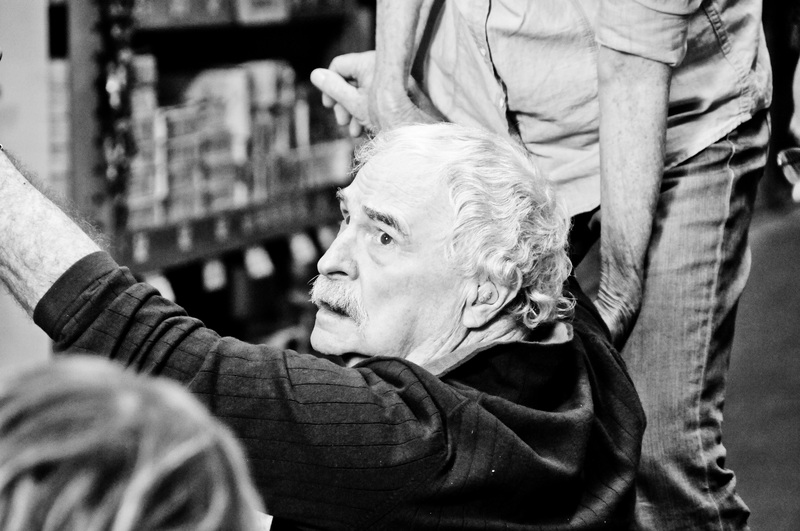 He was heavily involved throughout the entire process from way before pre-production to post-production and everything in between. He took time away from his very busy schedule to help out in any way he could and his passion for the project made all the difference on set. 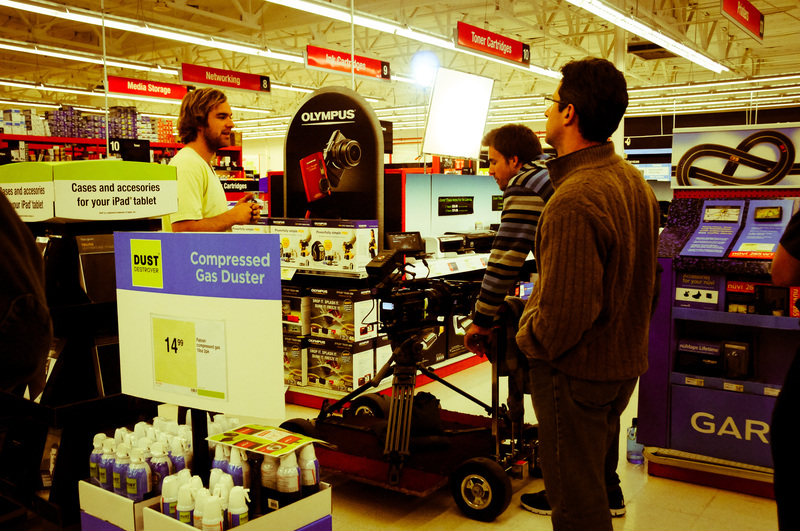 When you see someone as distinguished as Chief Price carrying film equipment between locations and helping out during the production you quickly see the kind of leader he is. Having him involved and showing how much he believed in the project was incredibly inspiring. Because of Chief Price’s great understanding of technology and cutting-edge thinking Lucas aptly calls him Chief 2.0 which fits him perfectly. Through my time interacting with Chief Price I know he is a great asset to not only this project, but the community at large and I am glad that I live within the San Ramon Valley District under his leadership. The production is currently in postproduction and is expected to be finished soon and will start to be shown in early January. I will be sure to post the video here and give more details at that time, so watch out for that. 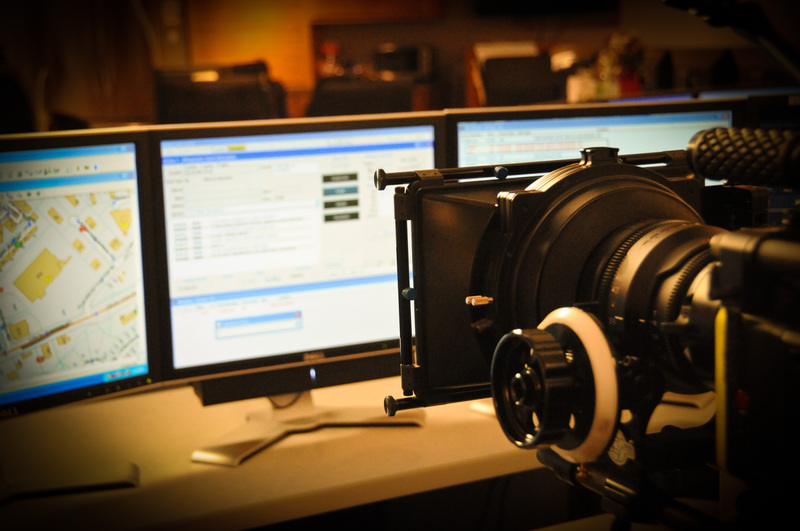 Take a look at the gallery of photos from the production to see some of the awesome equipment we got to use and get excited for the final product. I recently watched the movie The Social Network, based on the founding story of the website behemoth, Facebook. I found this story to be incredibly fascinating for many reasons. More than anything, thinking about the facts and figures about what Facebook has accomplished, including founder Mark Zuckerberg, in such a short period of time. In order to try and process some of the interesting information I decided to create a makeshift infographic. 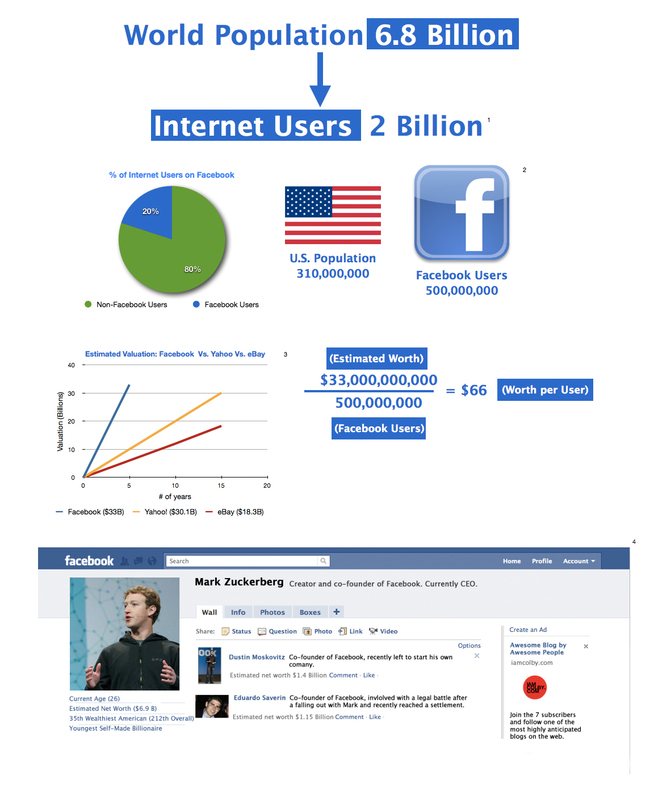 Take a look at it and take in just how huge Facebook is. Oh, all of this started in a dorm room, by a Sophomore, with nothing more than an idea, computer, and an internet connection, all of which has lead to three billionaires under 30.Get inspired.